A while back you might remember a call for help that went out when Australian Shepherd, Weasel was diagnosed with an often fatal disease. I'm happy to report that Weasel is doing well. Thanks to everyone that provided feedback, support and prayers for Weasel. Be sure to read the article submitted by Lynne Latham about how she and Weasel's dad, Robert, were able to turn things around and save Weasel from IMHA. Part of Weasel's treatment program included products from Vitality Science. They have an ebook available (no charge) that I just downloaded. It has a lot of great information that you will want to keep in mind not only when you are feeding your dog but when deciding what to eat yourself. By Lynne Latham – Immune Mediated Hemolytic Anemia (IMHA) is a devastating disease that often results in fatality. 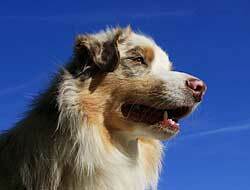 Read how one Australian Shepherd owner cured her sick dog, Weasel, of IMHA. 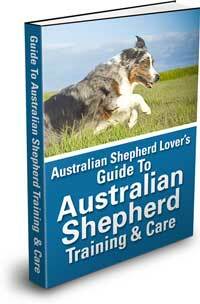 By Kathy Petersen of Rockland Aussies – When crate training puppy use these tips for best success with puppy crate training and housebreaking. Having the correct dog grooming equipment is important for making sure your Aussie looks neat and presentable. A proper grooming regime is also key for keeping away parasites like fleas and ticks. It's getting to be that time of year. 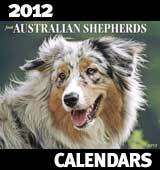 If you are looking for a new calendar for yourself or gifts have a look at the 2012 Australian Shepherd Calendars from Calendars.com. Let's hold off on winter a little longer. This beautiful photo of Aurora from Beth Beard takes us back to a sunny day at the beach.